The pecan tree (Carya illinoinensis) is the state tree of Texas and suitable for growing in all counties. Pecan trees are good for large landscapes as shade trees and for their nuts. Pecan trees prefer full sun and nutrient-rich, well-drained soils. 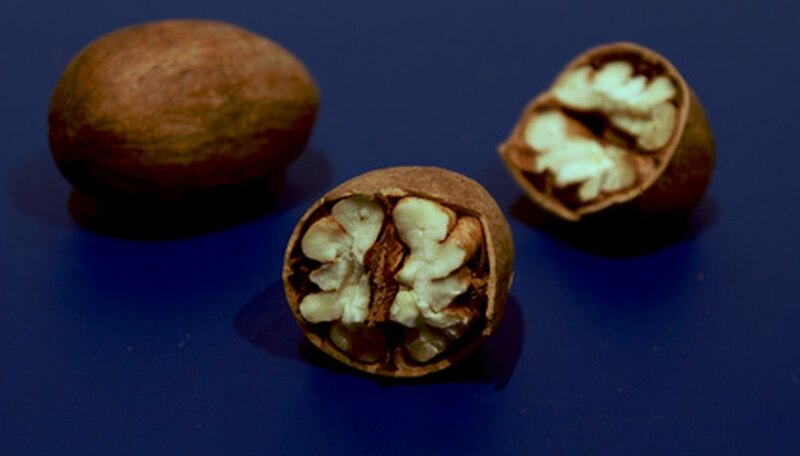 Grafted varieties are cultivated for nut production and quality and vary greatly by variety. Purchase container-grown, bare-root, or large-tree transplants from reputable nurseries and garden centers. Recommended varieties of pecan for northern Texas (in order of importance) include Pawnee, Maramec, Caddo, Osage, Shoshoni and Mohawk. Pawnee ripens very early and is especially good for the Texas panhandle region, according to Texas A&M extension literature. It produces a medium-sized, good-quality nut. Extension literature suggests Pawnee might have a natural resistance to aphids. Maramec pecan trees are strong and produce large nuts. Recommended varieties for eastern to southern Texas include Chotaw, Cheyenne, Desirable, Caddo, Cape Fear, Forkert, Kiowa, Oconee and Houma. Choctaw has striking foliage, is resistant to pecan scab and produces many good quality nuts, but it requires high-quality soil and careful management for the best performance. Cheyenne is a smaller pecan tree that produces high-quality nuts in five to seven years but is highly susceptible to aphid infestation. Recommended pecan varieties for western Texas include Wichita, Tijas, Cheyenne, Western, Pawnee, Burkett, Sioux and Caddo. Wichita is the most productive pecan tree grown in Texas, according to extension literature, and begins bearing fruit in only five to seven years. Careful pruning and management improves its appearance and production. Tejas is a large, vigorous tree, producing good-quality nuts. Grow Tejas in dry areas of the region. Recommended varieties for central to southern Texas include Sioux, Choctaw, Wichita, Cheyenne, Pawnee, Forkert, Cape Fear, Kiowa and Caddo. Sioux is a good pecan tree for the home landscape with its high quality nuts and strong, easily trained limbs. Sioux requires fungicide sprays during humid weather to manage scab disease. Forkert is a little-known, old variety from Mississippi, but it is gaining in popularity because of its excellent nut quality.